Bullying is repeated aggression – verbal, emotional, mental or physical, conducted by an individual or group of individuals against others. It is the intentional intimidation or putting down of someone, the misuse of power, position or some other advantage, which leaves them feeling upset, hurt or de-valued. Business Owners / Managers have a duty of care to their employees to provide a safe place of work. Turning a ‘blind eye’ to bullying-type behaviour in your organisation could put you in breach of the Safety, Health & Welfare at Work Acts. The effect it can have on the individual(s) targeted by the bully can be devastating. It also has the potential to damage morale amongst staff. We at Boyd HR believe that prevention is better than detection. We have designed and delivered Dignity & Respect in the Workplace Workshops which describes as to what behaviour is OK and what behaviour is WHOLLY UNACCEPTABLE. What do you do if one of your staff tells you they are being bullied? 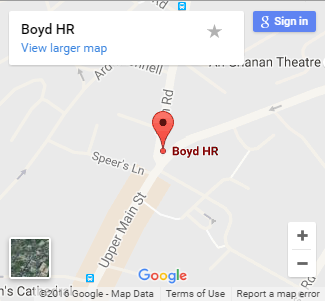 Call us at Boyd HR and we will guide you through the process.